For the past 4 years or so our missional faith community, Missio Dei, has periodically gone out to clean up and beautify at Evergreen Cemetery (at Harvey West park). It is owned by the Museum of Art & History, with the earliest headstone they’ve found going back to 1850. 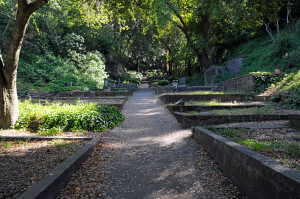 The city and the museum had a desire to see it cleaned up and become a safe family space like the park that surrounds it and a place to tell and celebrate the stories of history that make up Santa Cruz. We’ve also been out there for several years at their family legacy day where they honor a family who is represented there, do headstone rubbing with the kids, host a tour, and at the event we serve ice cream. They have wanted to make it a space where families could spend time and be comfortable enjoying the outdoor beauty of the area. A few m onths ago we were helping at the Legacy Day and as we walked to get Ice Cream I mentioned to Sibley, who is one of the primary leaders of the restoration project, that I thought it would be pretty awesome to watch the movie The Book of Life there as part of the museum’s Dia De Los Muertos celebration. He liked the idea and I let him know that our church family has a screen and projector that we could provide. He has the generator and popcorn machine, and the rest is history. On Sunday we get to hang out under the stars and watch the movie. God cares about people and stories. The beautiful thing about the space is the rich histories and real life stories that are represented there (including this story of Louden Nelson, a freed slave who came to Santa Cruz, bought property, and left an endowment for city schools upon his death). The Book of Life (as well as the tradition of Dia De Los Muertos) celebrates stories, the memories of people who have gone before us, and the value and power of love. Those of us who are followers of Jesus are part of a larger story that shapes us, stretching back thousands of years. Stories shape us, including those of the areas we live in. It’s cool that we get to watch this movie with our families amid the memories of all those stories that make us who we are today. We have issues with death. We were having some great political and culture discussions among friends who all had differing opinions at my house the other night. One of them who has been a nurse for over 30 years stated that as Americans, we are very afraid of death. While a cemetery can seem like an odd place to have an event, much of this is because of our fear of the unknown and what our culture has made “graveyards” out to be. 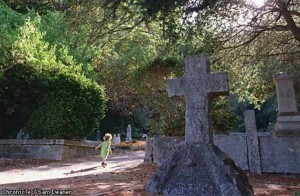 As people who believe that death has been defeated through the resurrection of Christ, wouldn’t it be cool to transform our ideas of a beautiful, old cemetery into a special place where another real and potentially beautiful part of our journey is recognized? Yeah, fun sounds like a good reason too. Watching movies together outside is fun, and it’s gorgeous out over at that park. We think part of being a community is having fun together and being out in our city. It’s another way of celebrating life. So that’s enough for me. And yeah, if I’m being honest there is that side of me that thinks it’s fun to say we’re watching a movie in a cemetery on Halloween weekend. But that’s the Jr. Higher who still lives inside of me and gets out sometimes. What time do you want to do the barbecue? When you come up my driveway might want to park at the beginning of the driveway rather than entering the gate of the little truck to turn around but we can make it work if you’re too wimpy to walk up the driveway!